Expressions of interest are being sought from developers for the construction of up to 1,200 homes in the north Dublin suburb of Donabate by Fingal County Council. The plan will significantly increase the population of the rapidly expanding town. It’s also likely to put more pressure on already creaking infrastructure in and around the capital. The planned new homes, which will include a mix of houses and apartments, will be located on land at Ballymastone in the seaside town. But the council does not intend to hold a public consultation process in relation to the project. That is despite the fact it is holding a consultation in relation to the drafting of a masterplan for a large tract of land in Balbriggan, just north of Donabate, where it also plans to build a significant number of new homes. That has angered some Donabate residents. “We are calling on Fingal County Council to hold full community public consultation into the plans, as is happening in Balbriggan,” said a spokesman for the Donabate Portrane Community Council. “Fingal County Council is not planning public consultation on the Ballymastone lands in Donabate, which is inconsistent and unfair. Fingal County Council insisted people will be able to make observations in respect of housebuilding on the site via the statutory planning process. It is intended that half the houses at the Ballymastone lands will be for private sale, 30pc for social housing, and 20pc for affordable housing. 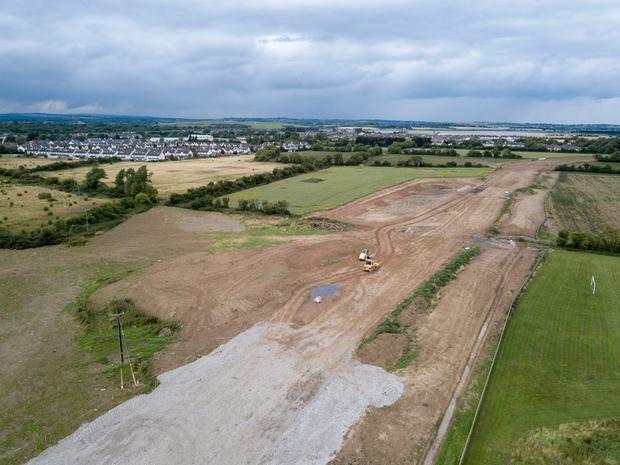 The council expects the land to be ready for construction next year after the completion of the Donabate Distributor Road. That €14m project is designed to open up lands around the town for development. Donabate has already become a significant focus for developers due to its relative close proximity to Dublin city centre. Among the developers involved in projects there are former billionaire property mogul Bernard McNamara. Fingal County Council has already embarked on a market-sounding exercise for the planned development on its lands at Donabate. “This market sounding is being conducted to solicit market feedback in order to assist FCC define various aspects of the project before commencing a procurement process,” it told prospective builders. “We are strongly focused on increasing housing supply in Fingal and realise that we need to work with the private sector to ensure that we produce the right mix of housing on our lands,” said Ann Marie Farrelly, director of planning and strategic infrastructure at Fingal County Council. The council said there are now 127 private sites in Fingal with planning permission to deliver 17,733 houses. The council has been set a target of delivering 1,637 social housing units in 2018 under the Rebuilding Ireland programme – the second-highest delivery target in the country. It has more than 200 acres of its own land earmarked for housing and set up an office called Project Talamh to co-ordinate development. Previous articleCan you guess these book titles based on cryptic descriptions of their plots?